For another project, I was interested in how many SM-3 Block IIA interceptors and ships capable of launching them the United States would have in the future. This post is the result of attempting to estimate how many Aegis BMD ships the United States would have by about 2040. In the next post, I’ll look at the numbers of interceptors. How Many Aegis BMD Ships Today? The U.S. Navy currently has 22 Aegis cruisers and 62 Aegis destroyers. Five of the cruisers (CGs 61, 67, 70, 72 and 73) have a BMD capability. 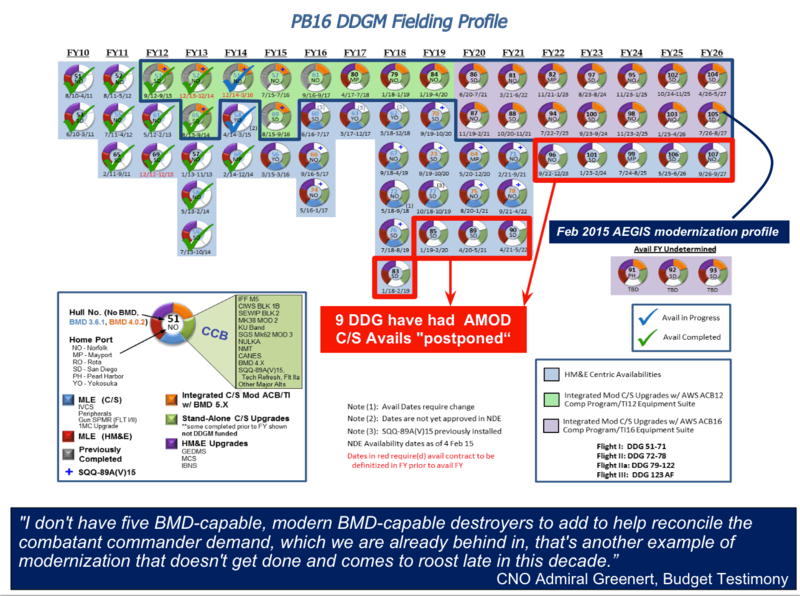 Of the destroyers, all of the Flight I and Flight II ships (28 ships, DDG 51 through DDG 78) have a BMD capability. None of the 34 Flight IIA destroyers (though DDG 112) have yet been given a BMD capability. Thus the United States currently has 33 BMD capable ships. These numbers are reflected in Figure 1 below. Figure 1. Planned (the chart was made in 2013) deployments of BMD capable ships as of 2015. Chart from: https://www.navalengineers.org/ProceedingsDocs/ASNEDay2014/Day1/AEGIS_CS2.pdf. Of the 33 current BMD capable ships, only a few have what the Navy refers to as the “advanced” Aegis BMD capability – including the capability to perform both anti-aircraft and anti-ballistic missile missions simultaneously. Ships with this advanced capability operate with an Aegis BMD 5.0 or higher system and with a version of the Baseline 9 computer system. Currently only about 3 destroyers out of the 33 BMD capable ships are equipped with the 5.0 (or 5.0 CU) Aegis BMD system and Baseline 9, however, this number will soon begin to rise rapidly. Ships without this advanced capability can be configured to perform either the anti-air or the anti-ballistic missile mission, but not both simultaneously. These ships include both cruisers and destroyers with the basic (3.6.x) and Intermediate (4.x) BMD capabilities. According to the Navy, its requirement for ships with advanced BMD capability is 40: four for the European Phased Adaptive Approach (EPAA) system, nine for forward deployment in Japan and 27 for carrier battlegroups. The Navy estimates that under its current plans, this requirement for 40 advanced capability BMD ships will not be met until 2026. The number of Aegis BMD ships requested by the regional combatant commanders is even higher, having grown from 42 in FY 2014 to 77 in FY 2016. In September, the U.S. Naval Institute reported the Missile Defense Agency (MDA) had reduced its projected numbers of BMD capable ships so that its projections now matched those of the U.S. Navy through 2020. Although the MDA’s current figure of 33 BMD capable ships remained unchanged, it now projects that it will have 39 BMD capable ships by 2020, down from the previous figure of 48. The new projection removes from the count newly BMD equipped destroyers whose crews did not have at least six months of required training and cruisers that would lose their BMD capability as a result of a modernization (see below). The new MDA projections are shown as the red “X”s on Figure 2 below. Figure 2. Projection of the number of BMD capable ships out to 2040. The blue circles show the total number of BMD capable ships. The blue squares show the number of ships with the “advanced” BMD capability, able to perform air defense and ballistic missile defense simultaneously (ships with Aegis BMD 5.x and some version of the Baseline 9 computer system). The red Xs show MDA’s current projections through 2020 and the red diamond shows the Navy’s projection that it will reach it requirement of 40 advanced capability ships by 2026. The numbers are broken down in more detail in Table 1 at the end of this post. Beyond 2040 the growth in the number of BMD ships flattens out as Block IIA retirements are almost matched by the deployment of new ships. (1) Upgrades to Aegis Flight I and Flight II destroyers. As recently as a few years ago, the Navy planned to upgrade all 62 of its existing Aegis destroyers to the advanced BMD capability. However, due to budget pressures in the last few years, these plans have been significantly scaled back. In 2014, it was announced that only seven of the 28 Flight I and Flight II destroyers would be upgraded to the advanced capability. The first of these conversions was completed in 2014 and the seventh will be completed in 2018 (all years in this post are fiscal years). The remaining 21 Flight 1 and 2 ships will only be upgraded to the intermediate capability (4.0.x). A note on how I am counting dates for upgrades: I am taking the date an upgrade is completed as the date the hardware installation was completed plus six months for training. The date of hardware completion is taking from Figure 3 below. For example, the first upgrade to the advanced capability (as signified by the orange band in the upper right quadrant and the green check mark) was to DDG-53, and was completed in September 2013. Adding six months for training, I then count this ship as upgraded as of FY 2014. Figure 3. U.S. Navy FY 2016 fielding profile for Aegis destroyers showing recent and planned BMD upgrades. Slide available at: http://i1.wp.com/news.usni.org/wp-content/uploads/2015/04/Screen-Shot-2015-04-21-at-3.24.53-PM.png. (2) Upgrades to Flight IIA destroyers. Until recently, the Navy planned to upgrade all of its 34 Flight IIA destroyers, none of which currently have a BMD capability, to the advanced BMD capability. However, it was recently revealed that five of these ships (DDGs 83, 85, 89, 90 and 96) will not undergo this upgrade, and thus will be left without a BMD capability. It is possible that these ships will eventually get upgraded, however, for the purposes of this projection I assume they will not. I assume that the 29 other Flight IIA ships will be upgraded to the advanced capability: the first 17 using the dates in Figure 3, and the other twelve at a rate of two per year thereafter. (3) Retirement of destroyers. Aegis Flight I and Flight II destroyers have a 35 year lifespan and the modernizations and upgrades they are receiving does not affect this lifespan. Thus I assume that each of these ships is retired is retired 35 years after its commissioning. For example, the first Aegis destroyer, DDG-51, was commissioned in 1991, and so I remove it from my count in 2027. The last three Flight II ships were commissioned in 1999 and so are removed from my count in 2035. The first Flight IIA destroyer was commissioned in 2000. Since these ships have a 40 year life span, none are retired on the time scale of my projection. (4) New destroyer production. The last of the current Flight IIA Aegis destroyers (DDG-112) was procured in in 2005 and commissioned in 2012. In 2010, procurement of ten additional Flight IIA destroyers began, and the first of these ships will enter service in 2016. Also in 2016, procurement of Flight III ships, with the new Air and Missile Defense Radar (AMDR), will begin. Together, these new production destroyers will be delivered at rate of about two per year. All of these ships will be delivered with the advanced BMD capability installed. Although the first of these new ships will be commissioned in FY 2016, allowing six additional months for training, I start adding them to the projection at the rate of two per year starting in FY 2017. (5) Cruiser modernization. Currently five of the 22 U.S. Aegis cruisers have either the basic or intermediate BMD capability; the others have no BMD capability. The U.S. Navy has developed plans for a program to modernize and extend the life of the last 11 of its 22 Aegis cruisers. The first of these ships (CG-63, no BMD capability) entered the modernization program in September 2015, and will have its life extended from 35 to 44 years. To reduce costs, the four BMD capable Aegis cruisers scheduled for this modification program would lose their BMD capability. However, Congress is currently blocking the Navy from removing the BMD capability from these ships and it is unclear how this situation will be resolved. For the purposes of this projection, I am assuming the modernization program goes ahead with eliminating the BMD capability with two ships per year in order of their commissioning date starting in 2015. This results in the loss of one BMD capable ship each tear from 2017 to 2020. The fifth BMD capable Aegis cruiser (CG-61) is not included in the modernization program and is removed from the projection after its 35 year life in 2025. The projection shown in Figure 2 shows the total number of BMD capable ships reaching 77 in 2040, all of which have the advanced BMD capability (or some future more capable version). This number is broken down in more detail in Table 1 below. Beyond 2040, the number of BMD capable ships would level off or even decrease as the deployment of new BMD capable ships is approximately offset by retirements of Flight IIA destroyers. It is possible this 2040 number could be even higher. For example, if the Navy subsequently decides to upgrade the five Flight IIA destroyers that I excluded from the projection, the 2040 number would be 82. However, it seems much more likely that the actual 2040 number will be lower than the projection in this post. As discussed above, in just the last few years there have been several decisions based on financial considerations that have significantly reduced the rate at which ships will be given BMD capabilities and the advanced Aegis BMD capability in particular. While the requests for Aegis BMD ships from the Combatant Commanders (currently 77) are likely to remain high, in many cases these requests could likely be met more cost efficiently by deploying additional Aegis Ashore facilities, particularly if these are equipped with SM-3 Block IIA or faster interceptors. Thus the 2040 number projected here may not actually be achieved until well after 2040. Table 1. Projected number of BMD capable Aegis ships through 2040. Ships with the advanced capability are shown in the last column. Number in this paragraph are from Ronald O’Rourke, “Navy Aegis Ballistic Missile Defense (BMD) Program: Background and Issues for Congress,” CRS Report 33745, November 10, 2015, pp. 14-15. Available at: http://fas.org/sgp/crs/weapons/RL33745.pdf. Sam LaGrone, “MDA Quietly Revises Projected Ballistic Missile Defense Ship Totals Down from FY 2016 Budget Request,” USNI News, September 2, 2015. Available at: http://news.usni.org/2015/09/01/mda-quietly-revises-projected-ballistic-missile-defense-ship-totals-down-from-fy-2016-budget-request. The MDA projections only extend through 2020. Sam LaGrone, “Navy Altered Destroyer Upgrades Due to Budget Pressure, Demand for Ships,” USNI News, June 3, 2014. Available at: http://news.usni.org/2014/06/03/navy-altered-destroyer-upgrade-plan-due-budget-pressure-demand-ships. In addition to the six ships shown in Figure 1 as being upgraded to Aegis BMD 5.0, DDG-61 Ramage will also be upgraded. Sam LaGrone, “Navy Again Reduces Scope of Destroyer Modernization, 5 Ships Won’t Receive Any Ballistic Missile Defense Upgrades,” USNI News, March 3, 2015. Available at: http://news.usni.org/2015/03/03/navy-again-reduces-scope-of-destroyer-modernization-5-ships-wont-receive-any-ballistic-missile-defense-upgrades. See Table 3 of Ronald O’Rourke, “Navy Force Structure and Shipbuilding Plans: Background and Issues for Congress,” CRS Report RL 32665, November 4, 2015. This table shows the U.S. Navy plans to procure two destroyers per year from FY 2016 through FY 2038. Available at: http://fas.org/sgp/crs/weapons/RL32665.pdf. Phil Ladouceur, “USS Cowpens Holds Cruiser Modification Induction, Change of Command,” September 25, 2015. Available at: http://www.public.navy.mil/surfor/cg63/Pages/USS-Cowpens-Holds-Cruiser-Modernization-Induction-Change-of-Command.aspx#.Vm3bDI-cGM8. The program is limited to beginning the modernization of at most two ships per year. This is the best analysis of the BMD capability that resides in the US Navy that I have read to date. Many do not understand most of the technical details concerning the difference between the B/L 3, B/L 4, and B/L 5 ships, or exactly what a B/L 9 computer upgrade involves. Those in decision making and program management better KNOW this stuff COLD including staffers helping to organize and inform congress so we can get TRUE Integrated Air & Missile Defense (IAMD) fielded ASAP. Next year increases to the funding will begin to flow to this priority with the new administration. We are dying here and progress is TOO slow. Every cruiser should be headed to a B/L 9 computer upgrade, and full IAMD capability in the future. All new destroyers, and Flt IIA destroyers should be the same story. The United States Navy needs 50+ Aegis Guided Missile Frigates with a baseline Tactical Ballistic Missile Defense (TBMD) capability at a minimum. The Aegis Guided Missile Frigate Facebook page applies.